Nice with some cheese crumbled into it, and I suspect a splash of cream although I didn't do that. Tentenary Biscuits were from a book called Super-Cute Cookies. Beat in the egg yolk and vanilla until fully incorporated. Add the flour and mix to a dough. Do not overwork. Put the dough in a food bag and chill for an hour. Roll out the dough and cut out. Chill on a baking sheet for 30 minutes. This helps to stop them spreading on the oven. Meanwhile pre heat over to Gas 6/400F/200C/180C Fan. Bake for 12-16 minutes until golden. The spelt version were just spelt flour (Dove's Farm) in place of both flours. You'll need to add just over half a teaspoon of baking powder too as it's not self raising. I iced them with Royal icing - box next to the icing sugar, purple instead of pink. I made it up with Seville orange juice instead of water. You can make a good chocolate version of the biscuit if you replace some of the flour with cocoa. Came from Good Housekeeping via my aunt about five years ago. lime wedges and basmati rice to serve. Chop the coriander stalks, fry in the oil. Add the onion and sweet potatoes and fry for another 10 mins. Add the curry paste and fry for another 3-4 minutes. Add coconut milk, stock and passata. Simmer until sweet potato is getting softer. Add the chicken and simmer until cooked - 15-20 mins. Garnish with the coriander leaves, chopped and lime wedges. Bread pudding - as made for the gather. Put all of your stale, but not mouldy, bread into a large mixing bowl and soak it in water for a couple of hours, or longer. Drain most of the water off by putting the bread mixture into a colander. Mash the bread with a fork. Mix in some dried fruit, a bit of sugar and some mixed spice. Stir in one (or two if you've got lots of stale bread) egg(s). Stir in some milk to make it suitably soggy. Bake until it seems cooked - probably about three-quarters of an hour, but maybe longer if it's a big pudding, at 180ºC. Sprinkle with sugar when it's done. Alternatively, get some proper instructions here! ETA to add oven temperature. Thanks, Katherine and Lottie. Recipes duly saved. Incidentally, I have a recipe blog here, to which I post sporadically but fairly regularly, if anybody should happen to be interested. Line a 23cm tin & grease the sides. Melt the butter, crush the biscuits and mix the two. Press it onto the base of the tin and refrigerate for 1 hour. Cream the cheeses together. Add the chocolate, beat, and then the eggs. Add the rose flavouring very carefully, tasting regularly - when you start to notice the flavouring, stop. Add the colouring, also carefully. Pour the mix on top of the base. Bake for 30 mins, then cover with a sheet of tinfoil (this stops the colour from going brown) and bake for 10 more minutes. Turn off the heat and leave it in the oven for an hour. Sprinkle the glitter over it and then refrigerate overnight. Today it tastes stronger so don't freak out if you don't really taste it right off! That sounds absolutely gorgeous! Incidentally, Lakeland sell Lavender extract. I bought some the other day. Place trifle sponges in a single layer in the bottom of an ovenproof or Corningware dish, preferably a square or oblong one. Sprinkle the sponges generously with blackberry brandy. Top with a thick layer of blackberries, well washed and allowed to drain dry. Beat the egg whites until stiff, then add the sugar a tablespoonful at a time, beating well between additions. When you have a nice, glossy meringue, spread it out over the blackberries and put into a low oven to cook. The really good thing about this pud is that it can linger in a low oven for ages, and still taste good. Variations include using lightly cooked apples or cherries in place of the blackberries. In fact, you can use any fruit that you wish to, using a related alcohol, such as Calvados with the apples. 2. Mix flour and baking powder then rub in butter. 3. Stir in sugar, baking powder and fruit. 4. Beat egg and milk in a separate container. Add most to main mixture but retain some for glaze. 6. Roll out to about 25mm thick, the flour will not rise as much as normal wheat flour, even with the baking powder. 8. Place on baking tray and glaze with remaining egg mixture. 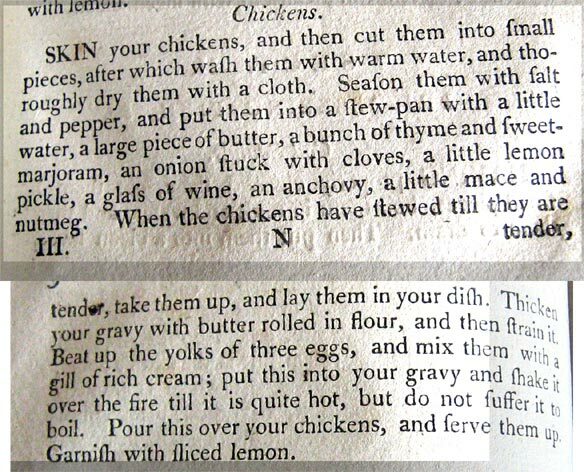 The subject of old cookery books has cropped up on another thread and it's made me think someone might like to try a recipe from the 18th century. I've made it several times myself but used a third of the amounts given. I also bought ready diced chicken. The sauce has a delicate flavour and isn't as rich as you might think. It goes well with rice. The recipe comes from Henderson's "Housekeeper's Instructor" which was first published in the 1790s although my copy is dated 1805. Fascinating. I mean the typographic use of ſ and s.
I'm used to it, but even so I did a double take when I first read a recipe that referred to a ſucking pig!!! (sucking pig). Same here - one of my favourite words is ſuſpicion! For the mathematicians and scientists here... Predictably this led to some internet research in which I learned that one of the most common modern day usages of ſ is in large italic form as the mathematical "integration" symbol, short for Greek "summa". Sorry for spreeing, but my last post was a month ago and it was a COMPLETELY different topic. Gluten free, but some ingredients come from factories where gluten is present. A recipe inspired by the granola flapjack in Costa! 250g of assorted nuts - Sainsbury do a bag of brazils, walnuts, hazelnuts and cashews which is ideal. 3. Cut the butter into pieces and melt in a saucepan at low heat. Add the sugar and syrup and stir until the sugar is dissolved. 4. Add the granola and porridge some at a time, stirring until the buttery syrup is evenly mixed. 5. Add the fruit and nuts. Keep on a low heat, stirring so it's well-mixed and hot throughout. 6. Allow to cool a little while you prepare your trays/cases. 7. You can pour into flat trays and cut into fingers when cool, which will give a traditional flapjack. But I prefer to use paper bun cases as its quicker and less mess. And Jayne's recipe is utterly utterly fabulous - the leftovers kept me going totally when I had very little energy after the gather! And now for a more boring recipe, the trouble is it was very much an "open the cupboard and fling stuff in the pan" sort of soup, but as Lesley requested a recipe and she must be obeyed I will do my best! this made enough for about 8-10 people I think? All veg is chopped roughly but fairly small, mainly to encourage it to break down a bit (especially the potatoes and carrots). Shove a bit (tablespoon??) of oil in a large pan and add a couple of chopped up onions (they were large so add more if small ones). Don't let them burn while you see what else is lurking in the fridge. Realise the only carrots you have are frozen ones so add a few of those (1-2 fresh would be much nicer). Add a couple of tins of morrisons cheapest chopped tomatoes (or possibly 3 I can't remember), rinsing out the cans with water so you add about half as much again water. Realise that it could do with more bulk and investigate the fridge again, find some rather elderly new potatoes and chop them up and throw them in the pan. (or whatever sort of potatoes you have lurking - probably a couple of medium sized ones, but don't peel them). Find the lentils and realise they are several years out of date, but as they look and smell ok pour them in anyway - about 200-250g. Stir and bring to the boil while stirring quite frequently as you rummage in the fridge again and find the garlic puree and squeeze in a couple of inches worth (or use fresh earlier), then shake the container of mixed herbs into the pan and add some veg stock - no need to make it up, just add the bouillon powder direct to the pan. Leave to simmer, stirring occasionally and then remember that you've forgotten the secret ingredient and find the marmite. Add a good squeeze of marmite/probably a couple of teaspoons worth. It doesn't make it taste of marmite but does make it richer. This is one of those soups that's better made a while before you want to eat it - it can be eaten the same day but give plenty of time for the lentils to soften. Add salt and pepper to taste. It's really nice served in a bowl with cheese on top which then melts in. Heat the cream over medium heat, just until bubbles start to form. In a bowl, whisk together the yolks, vanilla, salt and 2 tblspns of Splenda. Gradually whisk in the cream. Strain the mixture and divide into four Pyrex ramekins. Bake in a water bath for 25-30 minutes at 175˙ C. (the custards should be set, but still wobbly). Stir in pecans and one teaspoon of Splenda. Heat just until the pecans begin to color. Spread pecan mixture over the custards. Refrigerate for four more hours or overnight. Wish me luck, I have a diabetic friend coming for dinner in an hour! p.s. thanks for the kind words Caroline & Dawn! You will need a lined 1 kg loaf tin for 3 large eggs, or if using 4 large eggs, a square ‘batch’ tin. 2. Add the eggs in and beat the mixture until combined. 3. Sieve in the flour and add the zest of both lemons/limes and mix. 4. Next add 3-4 shots of gin and the juice of one lemon/lime, stir mixture until smooth. 5. Pour into the lined tin and place in the middle of oven for 35 – 50 minutes, depending on size of tin, or until the cake passes the knife test. 7. Mix the remainder of the gin, granulated sugar, tonic and the juice from the second lemon/lime in a bowl until you have a consistent mixture, plus extra lemon/lime juice if you have any to hand. 8. Prick the surface of the cake with a fork. 9. Pour the mixture over the cake and allow to soak in. 10. Enjoy your delicious cake! Hmmm - wonder if it works with raspberry vodka? Mmm, I will give this a go! I think I made this up, but I'm not sure. Cook enough wholemeal pasta spirals for two good servings. Chop a small/medium onion into small pieces. Wash and thinly slice a leek, and sweat both together over a low heat in melted butter. Make a pint of cheese sauce using your usual recipe but adding a good desert spoonful of French mustard. Drain the pasta, mix in the vegetables, then mix in the cheese sauce. Pour into an oven-proof dish. Grate some more cheese, scatter over the top of the mixture and reheat in the oven for about twenty minutes. If you omit the vegetables, add a tin of drained tuna fish, and carry on as before. Alternatively, sweat two leeks and chop up and add two or three rashers of lean bacon. Mix the lot together, and eat after it's been reheated for twenty minutes or so in the oven.